As you may know from reading my blog, I happen to LOVE crafts--I love making them myself, but I especially love seeing what others have made. The creativity that people have is so inspiring! 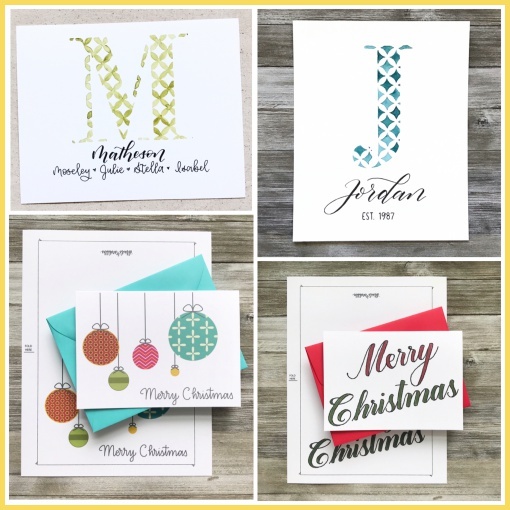 I asked my readers if anyone would like to share a link to their Etsy shop, so we can 'oooh' and 'ahhh' over all the pretty things, and maybe purchase a few Christmas gifts. 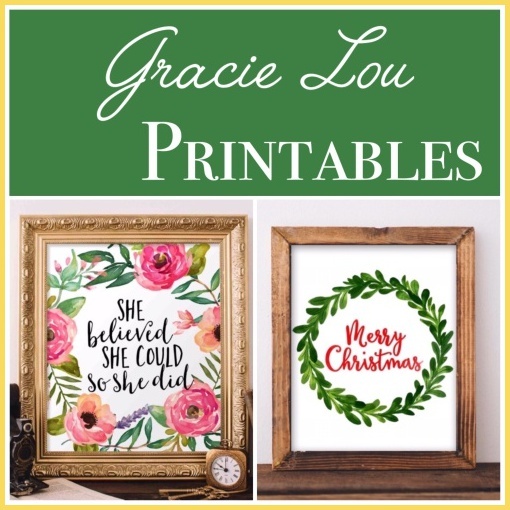 Gracie Lou Printables - "My shop is named after my little girl, Gracie. My shop is purely digital downloads. I’m a fan of pretty florals with an inspirational message... so that’s mostly what I offer!" Details & Scribbles - "I have always been a little artsy and over the last three years have really gotten into hand lettering and calligraphy. A few months ago I open my Etsy shop and it is slow going but hoping after the first of the year I can get a website up. I want to do more with wedding calligraphy and hand lettered prints. My Instagram shows more of what I can do for custom work but I do have some things in my Etsy shop." 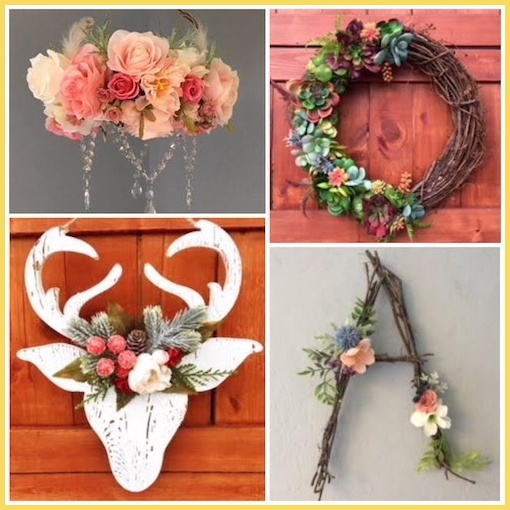 Do Good Decor - "By day, I’m a harried (albeit enthusiast) Mom, foster-Mom, & SPED teacher, but by night I’m a hot-glue-wielding bohemian with a passion for making original, high quality home decor and accessories. DoGoodDecor is a small shop with a big cause! It keeps me balanced and helps me support children in foster care by giving a portion of its profits to charities that aide these amazing kids!" 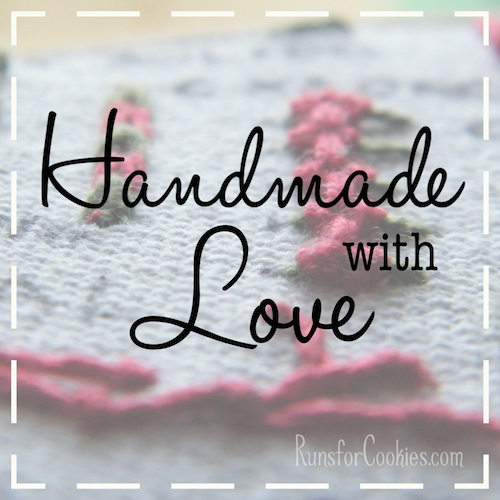 Eleventh Avenue Crafts - "I make handmade crafts with love. 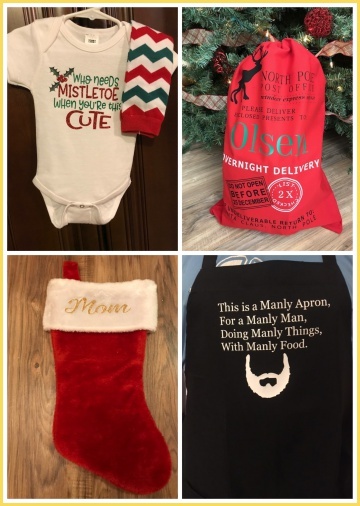 Currently, we have adorable onesies (some with leg warmers for an additional fee); Manly Aprons, our BIGGEST seller; personalized dog leashes in multiple colors; personalized Christmas stockings (felt and plush); and Christmas sacks. If you need a size or style that I don't have, please send me a message. I love to do custom orders." Runs for Cookies Reader Discount: I am offering a 20% discount for Runs for Cookies readers from 12/8/17 through 01/31/18. 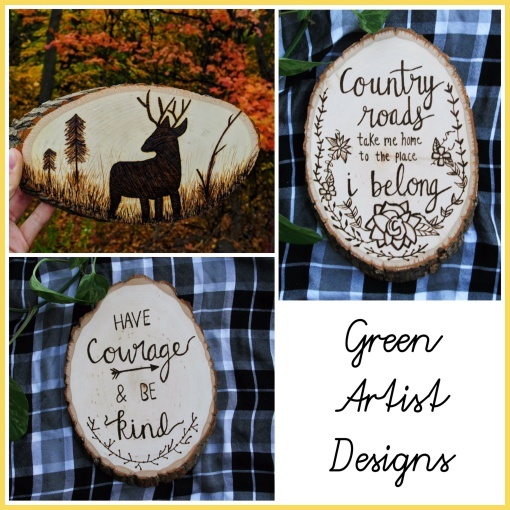 Green Artist Designs - "My shop is called Green Artist Designs. My Etsy shop is new, and I haven't had a sale yet. I make rustic wood burned signs. My work is inspired by nature. I love using wood as my canvas." H&H Jewelry Designs - "My Mom and I started the business together in 2005. H&H was the first initial of both of our last names, Hertel and Hodny. We started on Rubylane and then found Etsy. After my Mom unexpectedly passed away in 2012, I took over running the business solo but never changed the name. I make anything that sparkles, using mainly Swarovski Crystals, Murano Glass Beads, Lampwork Glass and Swarovski Pearls. I have a traditional and feminine style to my jewelry!" Runs for Cookies Reader Discount: Get 15% off with coupon code RUNSFORCOOKIES (this code is entered into a box during checkout). Valid 12/8 through 12/31. 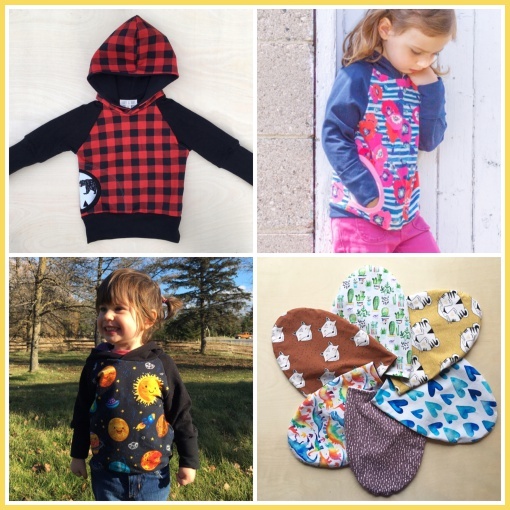 Maple & Ruby - "Comfortable and practical children's clothing, inspired by nature and the beauty of imagination. Handmade in Canada, frequently using organic and Oeko-Tex 100 certified materials. Women's line coming soon, but for now I have super comfy undies for women as well!" Mitten Made by LBB - "I have an Etsy shop that I just opened back in September! Most of my big ticket items are made to order, and some of the rest are ready to ship." Morning Clover - "Morning Clover was inspired as a creative outlet because I am a lover of local and handmade items. When I was little, I remember spending hours hunting for four leaf clovers and finding them. A four leaf clover can be thought of by each individual leaf--the first leaf symbolizes faith, the second leaf is for hope, the third leaf is for love, and the fourth leaf is for luck. Morning Clover is about starting your day off with luck while embracing each of the leaf meanings to have the freshest and luckiest day possible. 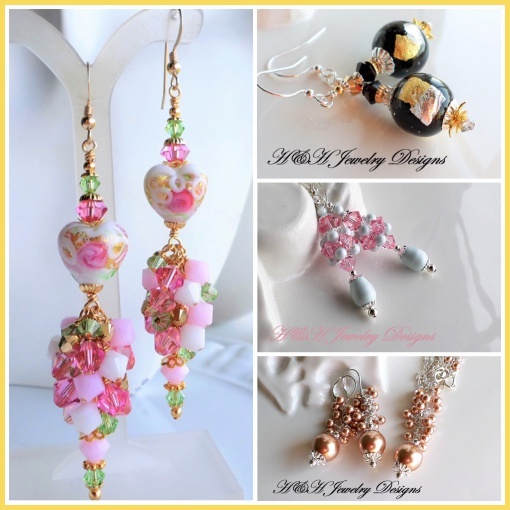 I make stud earrings and makeup bags and currently ship to USA and Canada." Paper Planes & Mud Pies - "My shop, Paper Planes & Mud Pies is comprised of block printed art prints. 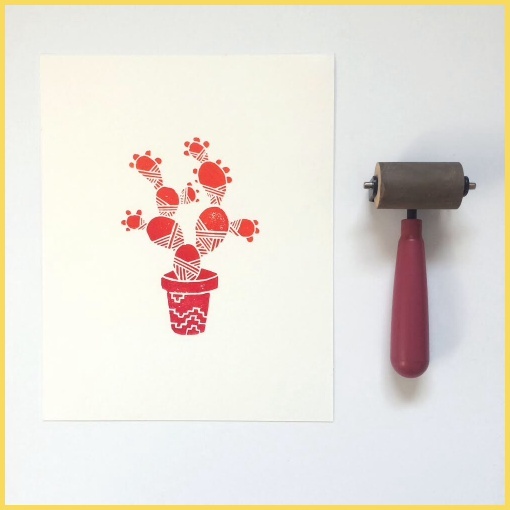 A block print is a form of printmaking that consists of hand carving a block (in this case a soft rubber), inking the block, and then transferring the print to paper or fabric. A lot of my work features Southwestern motifs, including cacti and mountains." Runs for Cookies Reader Discount: I'll be offering a special discount code to Runs For Cookies readers: take 15% off all orders over $20 through December 15th, 2017. Use code: RFC15OFF. 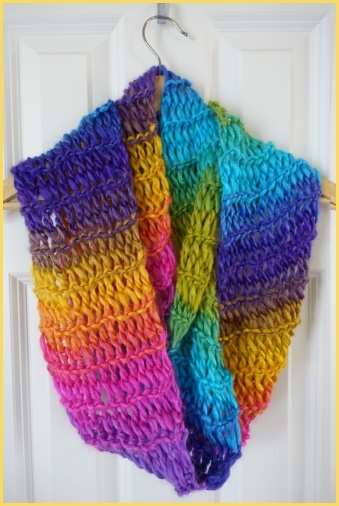 Dreamy Meadows - "I love to knit and be crafty--lately, I've been on an infinity scarf kick!" Runs for Cookies Reader Discount: The link to the shop includes a coupon code for 10% off any of my items. 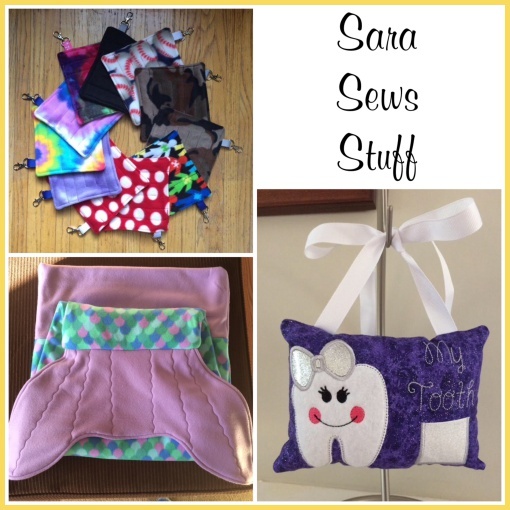 Sara Sews Stuff - "I have a sewing business. I make mostly children's items such as mermaid tail blankets, tooth fairy pillows, and marble mazes (a fidget toy where there is a marble sewn between two pieces of fleece and you manipulate the marble through a maze pattern.) My business is only about a year old so my Etsy store is still small. I have more for sale on my Facebook page." Runs for Cookies Reader Discount Code: Use coupon code COOKIES10 for 10% off any order of $50 or more valid 12/7 thru 12/16. Sewing with Scraps - "I love old quilts and repurposing items. 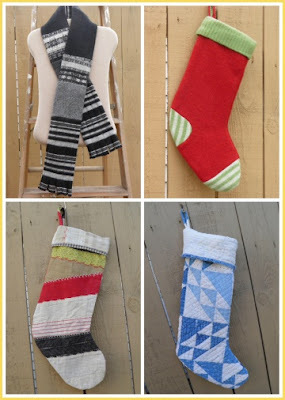 Currently I am selling felted wool scarves and Christmas stockings made from old wool sweaters that are washed and "felted" then cut apart and re-sewn into new items. (Scarves are great for Michigan winters!). Also, I have an assortment of Christmas stockings made from old quilts that have become too worn and tattered for use as blankets. I use the salvageable areas and sew into stockings. I can't stand the thought of these old beauties being thrown away." Runs for Cookies Reader Discount: With any purchase of 2 or more items, you can receive 20% off your purchase with code "COOKIES". 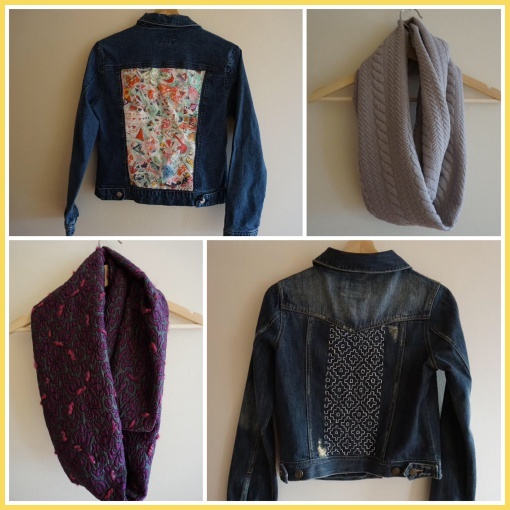 Thousands of Treasures - "I've always been interested in fun embellished denim jackets and cozy scarves. Seeing the price tags on some of them was discouraging, so I decided to try making some of my own and my Etsy shop was born." Runs for Cookies Discount Code: Readers can enter coupon code RUNS4COOKIES for a 20% discount. 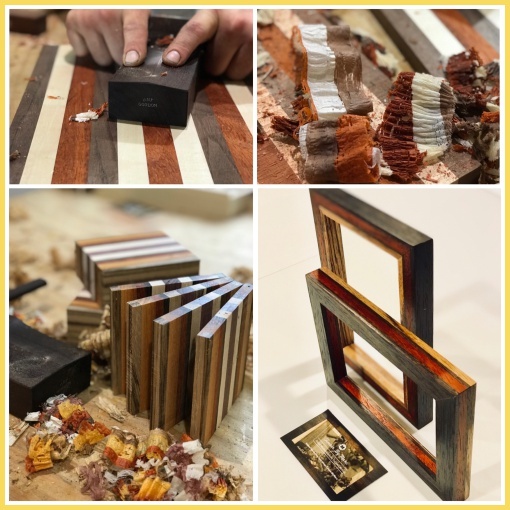 Timber By Marc - My guy and I have a woodworking business which we have on Etsy (mostly small things like picture frames) but he uses exotic woods (responsibly retrieved) which makes some of the stuff pretty special! He also uses hand tools which increases the quality and makes each one of a kind. Marc also has a stream on Twitch so people can watch him work in his shop! 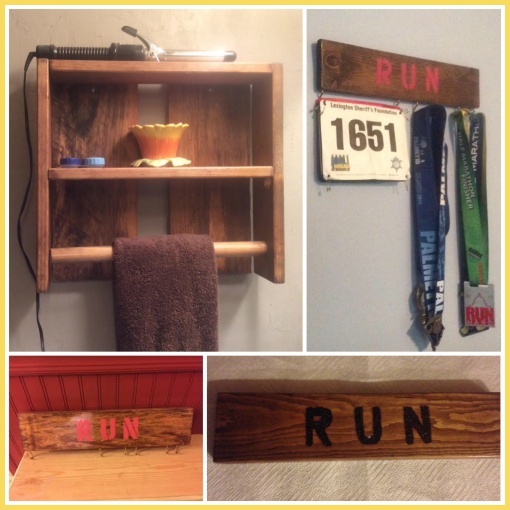 Twelve Mile Creek - "My husband made this run medal and bib holder for me about a couple of years ago. It’s one of my prized possessions because it was his own idea to make for me. Afterward, he began an Etsy shop called TwelveMileCreek named after the creek behind our home. He’s the creative genius, and I check the orders and send them out." Runs for Cookies Reader Discount: I’d love to offer your followers a 10% discount when they mention “Runs for Cookies” in their Etsy orders from now until May 15, 2017. 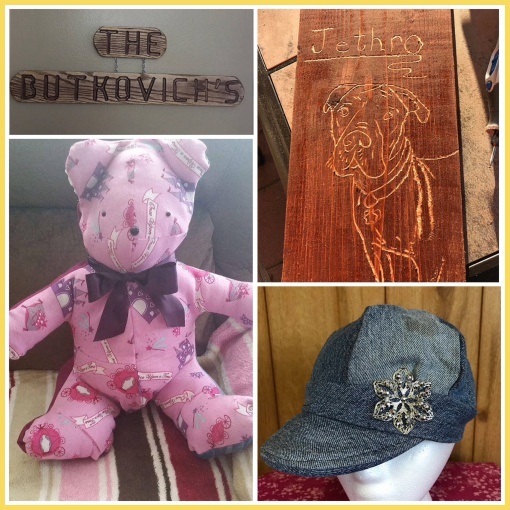 Thanks so much to all of you who shared your handmade goods with us! 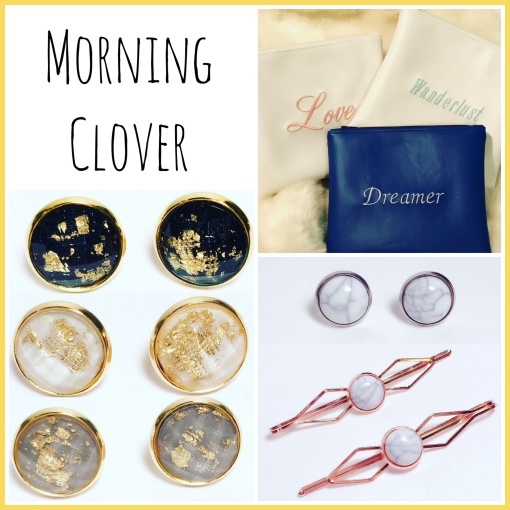 Thank you so much for featuring Morning Clover! Katie, thank you for featuring my shop H&H Jewelry Designs - what a wonderful group of talented Artists! Thank you for this fun post, and for listing my shop, DreamyMeadows! You have a lot of crafty readers with some amazing talents! I just loved this post Katie! Thanks for sharing. Thank you so much for featuring my shop! So sweet of you to support your readers. How wonderful of you to share these items! Beautiful products!